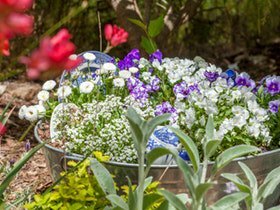 Now in its fifth year, the 2018 Creswick Garden Lovers Weekend is organised by Business and Tourism Creswick Inc. This community event showcases six unique and diverse private gardens to visit, including country gardens, backyards and courtyard gardens. A variety of commercial venues will be open, including Bells Water Gardens, Brenlissa Nursery, Creswick Nursery in Miss Northcott’s Garden, Lambley Gardens and Nursery, Maze House, Newlyn Antiques and Cottage Garden Nursery, Overwrought Sculpture Garden and Gallery, and Spring Park Nursery. There is also the Creswick Garden Clubâs Flower Show at the town hall; cafe and self-guided tours around the gardens of John Curtin Aged Care; Ballarat Bonsai Societyâs exhibition, demonstrations and sales at the Creswick Primary School Hall; community garden and displays at the Neighbourhood Centre; and much more.